Designing and furnishing a home is no child’s play. There is a lot of running around involved. Plus there is an added pressure to fit everything into the constrained budget. Most of the times you will find yourself stranded as you will not be able to turn to your friends for help and advice; the reason being that you and their budget and needs would be quite different. To top it all you will be unable to seek professional help in this regard as that would only mean added expenses. In such a case you will undoubtedly seek refuge in internet or hope that the dealer will give you the best possible advice. Such doubts and conflicts would be more so common when you would be thinking of flooring or going for the kitchen countertops; the presence of unceasing variety will do its best to confuse you. You will quite certainly want a product that fits into your budget and you might be thinking of using price as a criterion for determining the cut off. However, in spite of this cut off, there will be so many countertop options that would be shortlisted that you might be sitting with your head in your hands quite unsure as to what to do and what not to do. 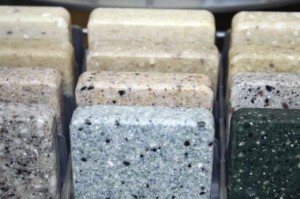 The best way to segregate a countertop is to go feature wise. On order to narrow down at the best option, you should first analyze all the materials on the basis of your needs and their features. Now since we are talking of countertop options, you will definitely buy something that is highly durable. Meaning that you don’t have to bear high replacement costs for the same. Apart from solid surface countertops prices, you would be definitely interested in their lifespan and their resistance to everyday wear and tear. Another feature that you might be interested in will be the weight and hardness accompanied by cleaning and color schemes. You should take care that you do not buy something that is too heavy or that is available only in a limited array of colors meaning that you will either have to build extra supports for the heavy countertop or else try and match your kitchen ware to a strange colored countertop. Once that you are done shortlisting based upon the features that you need, then you can move on to shortlisting on solid surface countertops prices. Most materials like quartz, marble and other like conventional options are priced similarly; neither too high nor too low, falling somewhere in the price range of 75 to 200 SGD Dollars. On the other hand durable substances like steel and soapstone fall in a far expensive category. In a similar fashion, materials like tiles, laminates etc.Can be bought for a lot cheaper but then you might have to compromise on the quality aspect. In short if you want to end up with the countertop of your choice you might have to be a little liberal with solid surface countertops prices.